Ask someone to name an athlete and the chances are they’ll say Paula Radcliffe. She is something of a demi-god in the public eye. Her new book, How To Run, is designed to get those who have never worn a pair of running shoes before out the door, and to help those who have started running to improve. There are oodles of books about running, and to stand out a new one has to offer something special. Paula’s (I feel I can call her Paula, everybody else does) has her name to help push up sales. But How To Run does have something else too, a very personal approach which many people will take to. There’s a lot of ‘I did this’, and ‘I think that’ interspersed in the text. The writing style is informal and chatty, and that goes a long way to making the book and the ideas it expresses very accessible. This is counterbalanced, though, by some seriously tough running schedules. There are several of these dotted about the book. The first is a 5k schedule that will have you doing some sort of activity four days a week, and which mixes up running and walking. This is ideal for beginners. But later on, the schedule headed ‘how to train for a fast marathon’ pulls no punches. There’s training activity six days a week, and even on the seventh you are invited to do some core exercises. The idea, I suppose, is that the book can have the broadest appeal possible, and cater to beginners and more experienced runners. And to that end it progresses in a fairly logical way. Paula starts out with three chapters that introduce you to running related matters such as, choosing kit, learning about foot strike and posture while running, exercises and stretching. 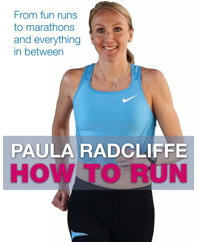 Not until Chapter 4 does Paula introduce actual running, and that’s after she’s covered a range of strength exercises. How To Run is picture heavy with photos on almost every page. There are lots and lots of photos of Paula demonstrating things. There are also plenty of photos of other bright young things in sporty clothing either running, exercising, or generally being active. They smile a lot. The exceptions are a couple of photos of older women (no older men, I’m afraid) running, and some of Paula looking to be three quarters through a tough race and definitely not smiling. Oh, and there’s a smattering of a smiling post-run victorious Paula too. The text is divided into short, discrete sections so that it is easy to pick up and read just a few pages at a time. You don’t feel compelled to read from cover to cover, either. The chapters stand alone and can be read out of order – though obviously those training schedules I mentioned earlier are a progression. How To Run covers a huge amount of ground and includes a section on women that addresses things like pregnancy, periods and menopause. I have to stress, though, this isn’t particularly a book aimed at women only. It’s appropriate for all. If I were coming to running for the first time I think How To Run would answer an awful lot of questions, give good advice, and see me through my first few races.